This post was sponsored by Hodgson Mill through my involvement with the Healthy Aperture Network. While my time was compensated, all thoughts and opinions are my own. Thanks for supporting brands that make this blog possible! By now, you probably know my thoughts on the whole New Year, New You thing. I’m just not that into it. But when I got the opportunity to work with Hodgson Mill to show of their new sorghum sides and ancient grain medleys as part of a New Year, New Grain campaign, I was down. My New Years “resolution” mantra is all about adding, not subtracting, and trying new foods is a great way to do that. Everyone knows whole grains are good for you. But just because something is good for you doesn’t mean you’ll like it. Pleasure is an important part of nutrition, and forcing yourself to eat foods you don’t like isn’t going to do you any good. So instead of making yourself eat whole grain bread or whole wheat pasta or brown rice, why not expand your whole grain tastebuds by trying new whole grains? And if you already do enjoy whole grains, why not add new ones in, since variety is another important yet overlooked aspect of nutrition. That's why I'm excited to share Hodgson Mills "New" ancient grains sides. 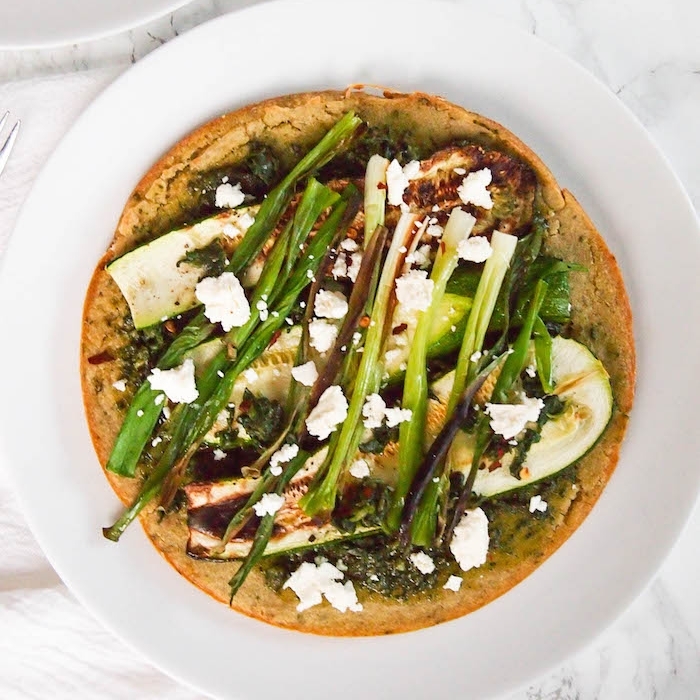 You or your family might discover they love ancient grain Sorghum or Teff, or heritage KAMUT(r) Khora san wheat, especially when it's presented with familiar flavors. Since Hodgson Mill sides come with grains and seasoning in one packet and take just 15-20 minutes on the stovetop to whip up, they round out your meal and take the intimidation factor out of trying something new. I think we’ve all had that experience of coming across a new food in the grocery store that we want to try, but end up putting it back on the shelf because we have no idea what to do with it. Since the sides already come packaged in flavors like chipotle, rosemary garlic and butter and chive, all you have to do is add protein and vegetables to make a complete meal. 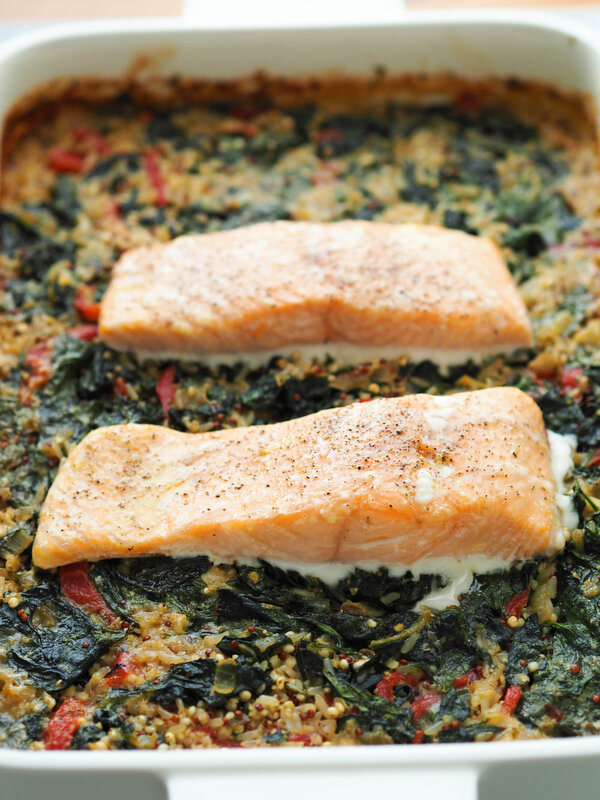 I wanted to show off how to use Hodgson Mill sides to create a complete meal that dirtied minimal dishes, so I created this recipe for one-dish baked spinach Parmesan risotto with salmon. Admittedly, the whole one-dish thing was a teeny tiny white lie since I had to use a skillet to sauté the onions and spinach, but I could have done it all in my Dutch oven, it just wouldn't have photographed very well. 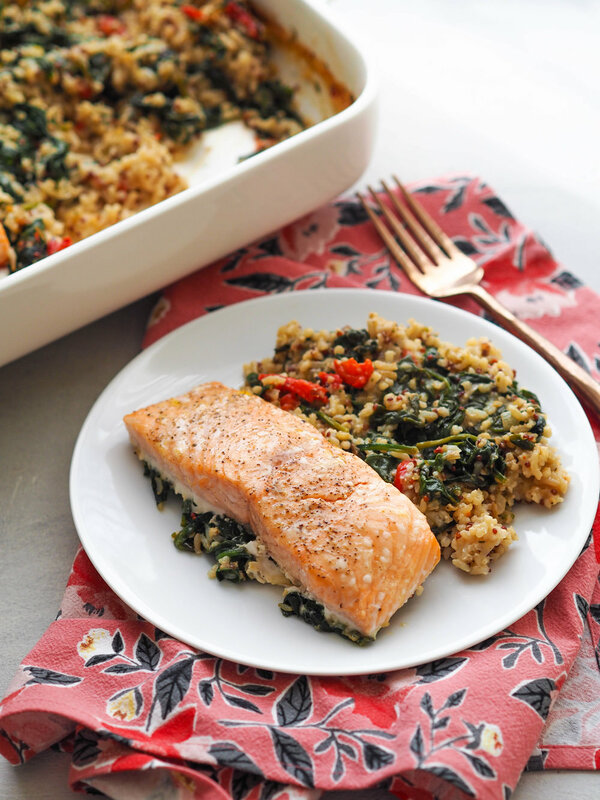 To make this dish, all you do is mix wilted spinach and roasted red peppers with Parmesan flavored sorghum side, broth, and a little more Parmesan cheese for gooeyness, bake in the oven, stir, then top with salmon filets to continue cooking. In the end, you get perfectly cooked salmon plus a “risotto” that doesn’t require an arm workout. It might not pass the muster of the judges on Top Chef, but I think you’ll like it anyway. The recipe is also pretty forgiving. If it dries up a bit too much, just stir in another ¼ cup or so of broth to get it nice and saucy again. If the salmon cooks before the risotto (depending on how thick the cut is, that might happen), just take it out and let the risotto continue to cook. You could also use other flavors of Hodgson Mill sides with this too! I think you could swap any of the other flavors without changing the recipe at all, although for chipotle, I might use sharp cheddar instead of Parmesan. See the full line of Hodgson Mill Sides here! Heat 2 tablespoons olive oil in skillet or dutch oven on medium-high heat. Add onion and garlic and saute 5 minutes until translucent. Stir in red pepper flakes and cook 30 seconds. Stir in spinach and saute until wilted. Season with a pinch of salt and pepper. In a casserole dish or the same dutch oven used to cook the spinach, mix together the sauteed spinach, sorghum side, broth, roasted red bell peppers and parmesan cheese. Place in the oven and bake 25 minutes. Carefully remove from oven to stir, then top with salmon filets. Drizzle the filets with 1 teaspoon olive oil and season with a bit of salt and pepper. Place back in oven and continue cooking 15-20 minutes until salmon is cooked through and risotto and tender and creamy. If the risotto isn't cooked through, remove the salmon and continue cooking. If the risotto starts to look dry, add a 1/4 cup more water or broth to loosen. Serve salmon filets over a scoop of risotto.